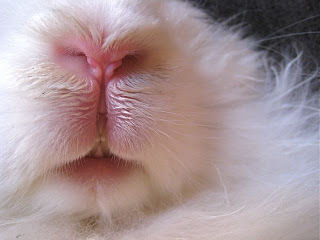 potentially nervous: lip detail for PJ. pj darling.....i know their lips look better when they aren't on their back. they don't part over their teeth when the bunnies are upright, but they just weren't having it today! bells kept charging the camera or putting his head down so much that his lips were pressed against the floor. nuage certaily wasn't going to cooperate if i pissed bells off. when all else fails....trance them! i hope what i've posted here will suffice, if not feel free to be even more demanding! we love it!! anyone else with bunny photo requests send em on in....we need as many inspiring assignments as we can get. Yeah.. kiss, kiss, kiss.. Mmmmuah! I can't get this trancing thing right.. none of my buns will put up with it..
"Allow myself to introduce... myself!"